Do I need to book my cycle in for service? No. We operate a 1st come - 1st served system and will generally turn your service around within 24 - 48 hours (subject to parts) and this means it shouldn't be necessary to book your cycle in for service. For smaller jobs (or if we're quiet) you can expect us to get it back to you the same day whenever possible. During the season (March to November) you can expect us to be busy all the time so please understand that waiting times can be a little longer during these months. Why are you recommending additional work to my cycle? Whilst we will do our best to identify/agree all parts and labour for you when you visit our store we can find that your repair needs some additional parts or labour that we could not easily identify without beginning work. Where this happens we'll do our best to talk to you about what's needed before we complete our work. You can be assured though that if we are recommending parts or labour then we've considered it carefully and your repair will be a better job. We don't inflate our work to make more money, it's not good Karma. Why do I need a new chain and cassette? We know that chains and cassettes are expensive items but they are standard service items and should be changed at regular intervals. If you catch your chain in time you can change it and it will run with your old cassette with no problem. If you run that old chain past a certain point though you will need to change the pair together as the new chain simply won't engage the cassette properly, particularly in that gear you leave it in all year. Be prepared to change your chain and cassette at major service intervals. I expected you to call me about any parts before you fitted them. We will always try to contact clients before we undertake additional work or fit major parts to a cycle. We are unable to call clients in advance of fitting minor items such as gear and brake cables or brake pads. These items are likely to be necessary at any service interval. If clients would prefer we don't change any item under a service then we need to know this in advance so we can agree expectations. Trying to ensure effective and safe operation might be difficult or impossible and we may decline to carry out any service or repair under such circumstances. Why is my bill more than I expected, it says £120 for a Platinum service on your website? We try to be clear about our pricing policy. All our listed prices are labour costs only, don't include any parts and are for guidance only. No matter which service level you choose we will do our best to complete all the work for the price we've indicated. Where we find, for example, that parts are properly seized in place and it takes two mechanics, all their breakfast and an hour to remove your bottom bracket then, we're sorry, but this is additional labour outside the scope of a normal service and we may elect to move to a pro rata hourly rate of £40. Rest assured though that we don't jump to this at the first sign of trouble. We will of course try to contact you if this situation arises. Please note that whichever service we undertake, a supplementary charge may be levied for 'specialist' work. Specialist work may include running internal cables or hidden cabling, a speciality wheel true or fitting new parts such as handle bars or levers. We can find items such as seatposts, bottom brackets or quill stems are seized in place. If we find a part is firmly held in place we will not automatically try to move it.Where operation is not compromised we will leave it in situ. Seized parts can often be freed but the effort can be intensive and may require significant extra labour costs. Freeing a seized part is not included in the cost of any of our standard services. The interweb is a wonderful place and we understand the inclination to source parts on line or through another retailer if a 'bargain' presents itself. Whilst we will always try our best to be helpful and offer advice and guidance on parts, compatibility and applications, there is a limit to how helpful we can be, especially if we feel you want to source your products online/elsewhere. We don't think it is unreasonable that any advice on the product should be sought from the online/other retailer rather than us. We don't match internet retailer prices because we are a' bricks and mortar' high street retailer and our workshop pricing structure is based around a whole service approach, so our labour fees and parts prices combine to make our business sustainable. This can mean that our parts may be slightly more expensive than the offers you see on the interweb. As a rule though we sell our parts at the Suggested Retail Price and we're in line with other local high street outlets. We generally believe that Velominati Rule #58 applies for parts you've sourced elsewhere, but we know that the interweb is here to stay and a bargain is a bargain! That reality means we will fit parts sourced elsewhere but please expect to pay a minimum 50% premium on our labour charges for fitting them and individual parts will attract an individual fitting charge. We don't of course warranty any of the parts you source elsewhere! Can you show me how to fix my bike? We can and do offer free advice and guidance on how to sort out minor cycle related mechanical issues, but fixing stuff is how we earn our living so there is, naturally, a limit to our advice or guidance. Please don't expect us to give you a lesson on how to fix your bicycle or get upset if we decline to give you all our knowhow. Watching a how-to video on the interweb can be helpful, but it can be a great way to muck things up. You are of course very welcome to follow the advice you get there. For us though, each service we carry out we do from a professional perspective. That means it has to be done right or not at all. We are always mindful that cyclist are out in the traffic and we absolutely don't want you getting hurt because of anything we did or did not do. The lawyers will have a field day - and we're not into that! Also, we know it's tempting (who doesn't like to see how a thing is done?) but please understand that our workshop is not open to the public (there are signs!) and if we ask you to stay behind the red line, we mean, stay behind the red line. First and foremost it's for your safety, if you get hurt then those pesky lawyers will be jumping around us. Why do you have a minimum charge for your service, it will only take you a minute? We operate a minimum labour charge policy, which is currently £8. At the end of the day we have to cover our costs to stay in business and whilst we will often do you a favour (no charge, something for our charity box, biscuits) we do reserve the right to charge you some cash for our labour. We have the tools, skills and parts to carry out the work that you are asking us to do and if we have to stop what we are doing to work for you, please expect to pay for our time. Can I borrow your workshop tools? We offer members of the public the opportunity to use our outside track pump for free (please don't abuse it) and we'll also lend you some tyre levers and a multi-tool (please return them) as well to get you on your way after a puncture. But that's it. Please don't ask to borrow other tools from our workshop. This is how we pay our bills. We know it might be frustrating for you 'as it will only take you a minute' but it's not a discussion topic no matter how quick you will be. If we say no then it's no, arguing with us won't change our mind. Please don't abuse us for saying no about borrowing our tools either, and please don't abuse our pump or our loaner tools. Please don't steal our tools either as it isn't nice and we will get the Old Bill on to you. Please also understand that you can't work on your bike in our store. We're sorry it's cold, raining or dark outside but that is our policy. Why do I have to pay for a whole day if I'm not collecting my Bike Pod until 5pm? The hire period starts from 9.30am on the first day of your hire period. We have to charge you from this time because we've had to ensure a box is going to be available for you on the day you asked for it, no matter what time you arrive to collect it. If you arrive to find we don't have a box available you won't be too pleased. Similarly, if you find you are delayed on your return, the pod got re-directed to Las Vegas or some other such calamity befell you, we'll potentially be stuck for our next client so we always ensure we have a box ready for our next client from the night before they are due to collect. That is also why we charge you double (£14 per day) for late returns. Why are you charging me for loss or damage? You should look after the Bike Pod whilst it is in your possession and when you sign for it you are accepting to pay for any loss or damage. When we release the pod it is always in proper working order and when you return it we will quickly check it and either accept it as returned in good condition or will point out anything that will need to be repaired or replaced. You are liable for the costs that we raise for any repair or replacement and we do not agree that you can source the parts independently. We need the Pod available immediately for the next customer. Returns - I want my money back! We are happy to exchange a product ( Tools are not included ) you have bought from us for any reason whatsoever, so long as you still have the receipt or proof of purchase, the item is unused and in its original packaging and is still saleable. If we decide to offer you a refund because the item is faulty, then we will again need the receipt/proof of purchase and if you bought the item on a credit/debit card we will need to have the card in order to refund the amount. We are sorry, but if you don't have the receipt/proof of purchase then we can't offer you an exchange or refund. Your statutory rights are unaffected. You serviced my bike last week but there is a problem! We are really sorry if you have had any problem after a visit to our store. Parts can fail and mistakes can happen but it's not a problem for us to check it and rectify any issues we find. We are professional mechanics and we guarantee our work and any parts supplied by us. 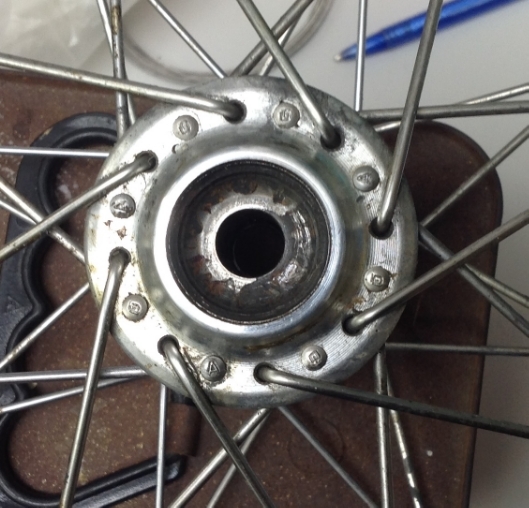 If you find there is a problem with your cycle following a recent visit to our workshop, just drop it back to us. If the issue is related to something we've done then we will, without question, put it right for you free of charge as quickly as we can. If it is a new problem then we will of course discus that with you and agree a way forward. What is a Valet Fee? Whilst most of our service plans attract some form of cleaning sometimes we come across machines that have been so unloved that we have to take extraordinary measures to clean them up before we start work. We'd like it if your bike was fairly clean when you brought it in as it is a drag having to literally chip away mud, grease and other unsavoury things before we start work; but it's not essential. If your bicycle is particularly heavily soiled we may charge a Pro rata supplementary valet fee! That's fair we think. Life is full of frustrations. We don't always get what we want, when we want or how we want it. We will though always do our best to be courteous and reasonable in our dealings with anyone who visits our store. Abusing our staff is not something we will put up with so please don't abuse us. It's not nice and we will call the Old Bill for you.